1855-58 Chalon Issue, Auckland Print, Imperforate, Unwmkd. 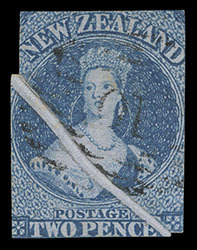 New Zealand, 1855, Queen Victoria "Chalon Head", 1d red on blue paper, Auckland printing, unwatermarked, unused without gum, full margins except just in at bottom left, deep intense color on deeply blued paper, trivial corner crease at bottom left, Very Fine appearance; with 1963 B.P.A. certificate. Scott No. 4. Campbell Paterson No. A1c (2) $25,000 ($17,100). SG No. 4 £13,000 ($17,080). AN ATTRACTIVE UNUSED EXAMPLE OF THE 1855 1D RICHARDSON PRINTING. 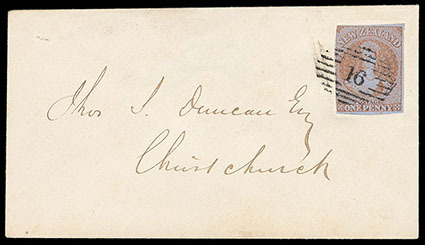 New Zealand, 1855, Queen Victoria "Chalon Head", 1d Bright red on blue paper, Auckland printing, unwatermarked, horizontal pair, each cancelled by indistinct barred oval, large to huge margins all around except barely touched at top, remarkable bright color on pristine deeply blued paper, Very Fine, R.C. Agabeg, Robson Lowe, March 1971, lot 1018; with 1948 R.P.S.L. certificate. Scott No. 4. Campbell Paterson No. A1c (1). SG No. 4 £4,000 as singles ($5,260). 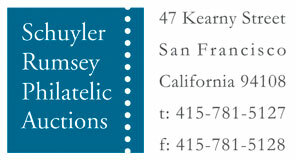 A CHOICE PAIR OF THE 1855 1D RICHARDSON PRINTING WITH SUCH EXCEPTIONAL COLOR. 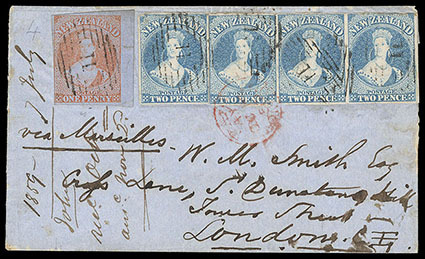 New Zealand, 1855, Queen Victoria "Chalon Head", 1d red on blue paper, Auckland printing, unwatermarked, horizontal strip of three, center stamp with natural pre-printing paper fold at top left, sharp strikes of numeral "18" barred oval of Otago, remarkable large margins all around, Extremely Fine and choice; with 2000 B.P.A. certificate. Scott No. 4. Campbell Paterson No. A1c (2). SG No. 4 £6,000 as singles ($7,880). A STUNNING USED MULTIPLE OF THE 1855 1D RICHARDSON PRINTING. New Zealand, 1855, Queen Victoria "Chalon Head", 1d red on blue paper, Auckland printing, unwatermarked, mostly large margins except touched at bottom left, deeply blue paper, tied by bold numeral "16" barred oval, matching "Port Victoria, New Zealand, AU31 1857" rimless origin backstamp on local cover to Christchurch; small part of flap missing, Extremely Fine and choice local post use. Scott No. 4. Campbell Paterson No. A1c (2). SG No. 4 Estimate $2,000 - 3,000. A CHOICE 1D LOCAL POST USE OF THE 1855 1D RICHARDSON PRINTING. This was prepaid for the 1d per ½ oz. local post rate within the province of Canterbury. The Local Posts Act was revoked on January 1, 1859. References: Illustrated in Odenweller as figure 3.5, p. 40. New Zealand, 1855, Queen Victoria "Chalon Head", 1d red on blue paper, Auckland printing, unwatermarked, horizontal pair, huge margins except touched at bottom left, tied by two strikes of numeral "18" barred oval, matching "Otago, New-Zealand, JY 5 1858" rimless origin cds on blue folded cover to Moeraki, 1858 docketing at left, Very Fine and scarce pair used on domestic mail; with 1994 B.P.A. certificate. Scott No. 4. Campbell Paterson No. A1c (2). SG No. 4 Estimate $5,000 - 7,500. This was prepaid for the 2d per ½ oz. local post rate within the province of Otago. Joseph Hackmey, Spink Shreves, May 2010, lot 2071; with 2006 R.P.S.L. certificate. Scott No. 4. Campbell Paterson No. A1c (2). SG No. 4 Estimate $3,000 - 4,000. 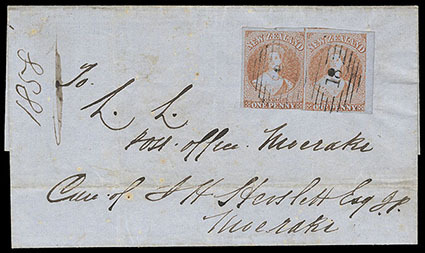 A REMARKABLE MIXED ISSUE FRANKING AND THE ONLY RECORDED EXAMPLE OF A SINGLE 9D RATE "VIA MARSEILLES" LETTER BEING PAID IN STAMPS PRIOR TO THE AUGUST 1859 INTRODUCTION OF THE 6D STAMPS. Although marked and paid to go "via Marseilles", the cover appears from the London datestamp to have been sent "via Southampton". The "via Marseilles" mail arrived on October 7th. At this date only 1d, 2d and 1s stamps were available and a minimum of five stamps were needed to make up the 9d rate. 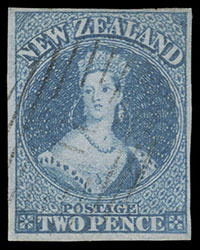 New Zealand, 1856, Queen Victoria "Chalon Head", 2d blue on blue paper, Auckland printing, unwatermarked, part o.g., small hinge remnants, full large margins all around, beautiful bright color and paper, Very Fine and choice mint example of the 1856 2d Auckland print issue; with 2000 B.P.A. certificate. Scott No. 5. Campbell Paterson No. A2b (1). SG No. 5 £3,000 ($3,940). 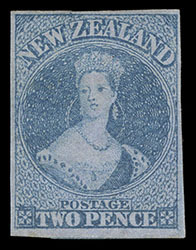 New Zealand, 1856, Queen Victoria "Chalon Head", 2d blue on blue paper, "Two Pearls" variety (Pos. 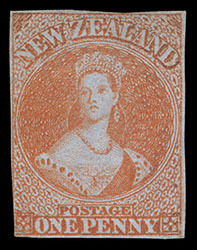 R. 14/5), Auckland printing, unwatermarked, large margins, strong color and impression, cancelled by numeral "11" of Port Ahuriri, Very Fine and choice example of this variety; with 1991 and 2007 B.P.A. certificates. Scott No. 5 var. Campbell Paterson No. A2b (1). SG No. 5 var. £300 as normal ($390). A constant flaw, noted from the London printings but more difficult to see in the later printings. Characteristics are two colored spots close together, the right spot higher than the left, on the Queen's neck within the arc of the necklace. Likely caused by foreign material creating pits in the plate at the time of manufacture. New Zealand, 1856, Queen Victoria "Chalon Head", 2d blue on blue paper, preprint paper fold, Auckland printing, unwatermarked, light numeral "10" barred oval of Wellington, large fold, margins tight to slightly in, deep color, F.-V.F. and striking example of this printing variety. Scott No. 5. Campbell Paterson No. A2b (1). SG No. 5 £300 ($390). 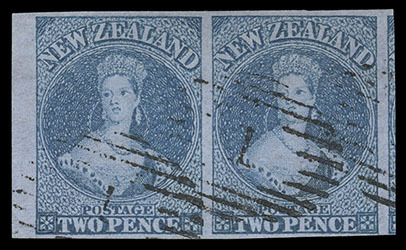 New Zealand, 1856, Queen Victoria "Chalon Head", 2d blue on blue paper, Auckland printing, unwatermarked, left margin horizontal pair, watermarked "S" of "Sands & Kenny", cancelled by numeral "1" barred oval of Auckland, large margins all around including part of adjacent stamp at right, an Extremely Fine gem; with 1975 Raybaudi certificate. Scott No. 5. Campbell Paterson No. A2b (1). SG No. 5 £600 as singles ($790). 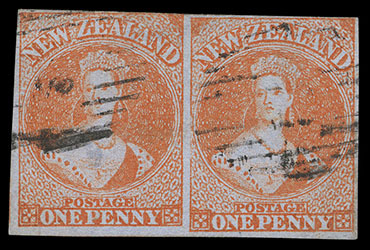 A STUNNING LEFT MARGIN PAIR OF THE 1856 2D AUCKLAND PRINT ISSUE SHOWING A PORTION OF THE WATERMARK.